Preston have sacked manager Paul Simpson after the club's poor run of results in the Championship. North End have won only three league games this season and lie 21st in the table, with Saturday's abject 3-0 defeat at Hull the final straw. Assistant boss Rob Kelly will take temporary charge of the first team. 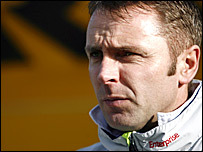 Simpson took over from Billy Davies in June 2006 and took Preston to the top of the Championship in November but a slump saw them miss the play-offs. Chairman Derek Shaw said: "It is with a heavy heart that this sort of decision is made but the board and I felt that a change was necessary to try to halt the recent slide in results and performance. "Modern football is a cut-throat industry and is results-based. Without an away win in the league this season and with three away league wins in the whole of 2007 we felt we had to act now." Simpson accepted that results had not been good enough but believes Preston will always struggle to escape from the Championship. "Results dictated it - that's the top and bottom of it," he told BBC Radio 5 Live. "It's been a good experience and I've learnt a hell of a lot - good and bad. "It's a very, very tough league. There are some big clubs, some wealthy clubs and even those that are not wealthy are finding money from somewhere. "Preston don't have the funds available to throw two and three million at signing a player. "As much as the board may say they have backed me all the way, I've probably spent about a million and a half since I came in and we've had to sell players left right and centre." Shaw told the club website he was keen to appoint a replacement before the Preston's next league game against promotion-chasing Charlton on 24 November. The pressure mounted on Simpson when the club board released a statement after Saturday's defeat to Hull saying they were "very disappointed with the performance and result". His reign had started promisingly. After leading hometown club Carlisle to back-to-back promotions, the 41-year-old took over after Davies left for Derby. The club made a strong start to last season, hitting the top in November - the club's best position for 55 years. They spent most of the season in the top six but a dramatic slump which saw them lose seven of their last eight games meant they finished seventh and out of the play-offs.